While you are at DAA, take a look at other classes that are available. All of them are terrific. And for fun…here is another image that I did in Corel Painter 2015. Corel Painter 2015, Wheat Fields with Bright Sky, Particle brushes and Real watercolor brushes. 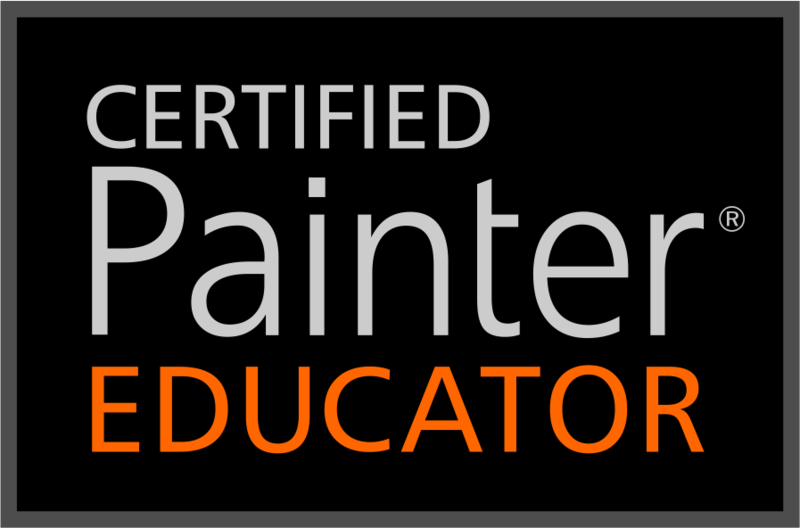 This entry was posted in 2014 Corel Painter Posts and tagged Corel Painter 2015 Classes, Corel Painter 2015 Tutorials, Corel Painter 2015 Videos, Corel Painter 2015 What's New, Skip Allen Classes. Bookmark the permalink. I have no intentions of ever buying an Android or a PC. I’m an Mac and iOS user only. Will you be spending a lot time with those other systems? Currently, a Mac and PC work the same with Corel Painter 2015…both are 64-bit. You go to a different place to access preferences in a Mac than you do in a PC, and I explain that. Macs do not have a movie function, and PCs do, but that isn’t new with 2015 so I will not cover it. I do mention that Painter currently is RTS compatible, which is only for Windows machines…Mac doesn’t have that capability. I do work on a PC in the demos; I don’t have a Mac, but I am pretty familiar with Macs…no expert…but I can get around in one. I don’t think it matters if you are using a Mac or a PC for this class. I do understand folks have preferences. Like you, I do, too. I will probably never buy a Mac or an Android; I have a PC and an iPhone. I do say from time to time I need to buy a Mac for class purposes; I try to keep an open mind. My partner has an Android and I have used the new Mobile Painter on it…very cool. I downloaded the french version of Painter 2015. I should have got the english one. Easier to follow your class. Do you think I can download both versions? I really don’t know. I know you can load one version on two computers, but not sure about getting French and English versions. I have had meetings with a friend who lives in France, and it is difficult to go back and forth between English and French versions.